The Millennium Book of the Papillon was published in 2000 and sold out within a few months of publication date. The Book brought together for the first time ever advertisers and contributors to articles from around the world and perhaps for the first time ever opened the eyes of many breeders and exhibitors to the quality of the breed in other parts of the world. Of particular interest in the publication were the articles and colour photographic plates relating to the phalene. Thanks to this publication interest in this charming variety of the breed exploded. As well as advertisements from many of the top kennels around the world, the book also included reviews of the breed from some 22 countries all writte4n by experts from the relevant country, articles on health and other issues, articles on ear carriage and phalenes, as well as hundreds of photographs and original illustrations all in wonderful colour. The above is taken from the front cover of the Book and shows the high quality of the art work. Londa Downing--Marlon Papillons (USA) Just a quick note--I'm home for lunch. Just wanted to tell you that I received my handbooks yesterday. They are lovely! You did a great job in putting together such a wonderful, beautiful book! I like the information areas also. Again, thanks for all your hard work. Debbie - Janais Papillons (USA) Hi, sooooo happy to tell you that my handbook arrived today. :-) This book is the most beautiful book on paps I have seen yet. Thank you so much for all your efforts to include everyone. I am very happy to have an ad in this gorgeous handbook. Marianne Hansen - Toymaker Papillons (Denmark) Hello everyone, today I have got the Millennium Book, and there is only one thing to say:" It is wonderful" Thanks Deirdre. Lise Verberg - Kecil (Denmark) Im very impressed with the Millennium Handbook what a great job you have all been doing! Ginny Cann (Canada) wow! supercalafragalisticexpeealidocious!!!!! beautiful book, congratulations to all involved. Moira Ure - Annacott (Canada) A wonderful book - lovely art work, great informative items, lovely set up. Just a real joy. 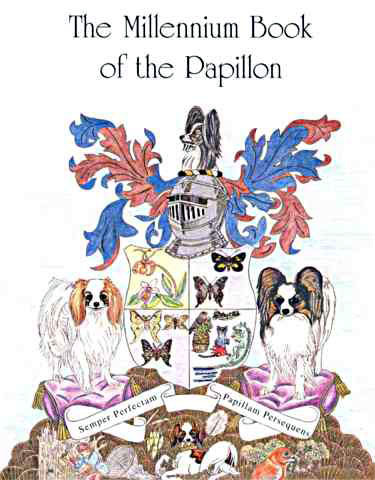 Will be ordering a couple more as soon as possible for some of my papillon friends. Deirdre and Co - thank you so much for all your effort. Betty Cataldo - USA I received one copy of the Millennium book and thought it was really great, it is wonderful to see all the dogs from all the other countries and the book was put together beautifully, the art work is super, there was not one thing I did not like about the book, I will treasure it for many years to come, I thank you for a job well done. Regards Noeline Quinn - Quinvale (Australia) Well the Australian people I know have all received their Handbooks & ALL say it is a credit to you all. Great publication, the time. Robyn Hicks, Dgeri Papillons, Clovis, CA (USA) I received mine two weeks ago, it is marvellous!!!! I would love to order an extra to have around in case something happens to my original! I wish we could do a full color handbook of this quality! Everyone involved in this endeavour, from the editor/publisher to the authors of the articles did an outstanding job. THANK YOU! Tracy and Russ Burdick - Denzel (USA) Just a note to tell you that the book is FANTASTIC! Also incredibly informative and stunning to look at. Please give Dierdre my congratulations on a phenomenal job that was done to perfection! P.S. Also many thanks to you both for your hard work on the book, which clearly shows your unwavering dedication to the breed. Laila Grönningen, Chakmani's Kennel Norway Yes I got the book and I love it!! It was very beautiful with many lovely pic. I always have it close to me to have a look, I cant get enough of it. Ingegerd Holmsten Sweden We are very grateful for the prompt delivery of the books! Me and my friends find it absolutely wonderful! It makes it possible to get in touch with papillon-lovers all over the world. A "must" for every papillon-friend. Ella Blakeley - Emberglow (USA) I have now received my copy of the Millennium Book. It was worth the wait!!! It has very good quality pictures and printing and the art work is exquisite!! Lou Ann King - Loteki USA I have thumbed through the handbook and find it absolutely lovely. I do believe this sets a new standard in publications. Thank you and Deidre for taking on this project! It is definitely an endeavor of love and it shows. Deidre's drawings are wonderful! Grant & Melissa Fancey, Sealoch Shetland Sheepdogs & Papillons Truro, Nova Scotia, Canada This book is a piece of history, which can only become more valuable as the years go by It is my belief that the Papillon community owe a great debt of gratitude to these dedicated people. Thank you, Folks. Karen Murad, Krystal Papillons, Graham, WA USA I would like to thank you for all of your hard work to produce the book, of course, along with Dierdre. It is truly a lovely volume. I am also impressed with the articles and reports from different countries. Great idea.